An XMC module with two, 5.1 GSPS, 16-bit DAC's, PLL, 8 GB DDR4 and Xilinx UltraScale FPGA. A Xilinx Virtex UltraScale XCVU060/085 FPGA lies at the heart of the product, supported by with 8 GB DDR4 and 4 MB of QDRAM memory, providing a very high performance DSP core for demanding applications such RADAR and wireless IF generation. Innovative Integration, a trusted supplier of signal processing and data acquisition hardware and software solutions, today announced the XU-TX - an XMC module featuring two, AC-coupled, single-ended 16-bit DAC outputs with programmable DC bias. The DAC devices employed support synchronization and interpolation and their unique output circuits allow improved frequency synthesis in the 2nd and 3rd Nyquist zones, to shift of the Nyquist null frequency in the output spectrum by a factory of two. The DAC ICs may be clocked at up to 5.1 GHz via an onboard, ultra-low-jitter PLL. A unique feature of th PLL guarantees multi-board synchronization when supplied a 1/16th -rate external reference and trigger. Sixteen high-speed serial links connect to the host (eight via XMC connector J15, and eight via J16). 8000 MB/s PCIe gen3 and Aurora protocols, respectively are supported. 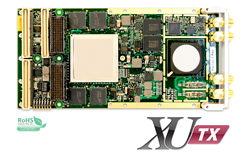 A Xilinx Virtex UltraScale XCVU060/085 FPGA lies at the heart of the product, supported by with 8 GB DDR4 and 4 MB of QDRAM memory, providing a very high performance DSP core for demanding applications such RADAR and wireless IF generation. The close integration of the analog IO, memory and host interface with the FPGA enables real-time signal processing at rates exceeding 7000 GMAC/s. Customizable The XU family can be fully customized using VHDL and MATLAB and the FrameWork Logic toolset. IP logic cores are also available for SDR applications that provide multi-channel modulations for PSK and FSK systems. Applications include: High Speed Arbitrary Wave Generation, Wireless MIMO transmitter, RADAR Waveforms, and Electronic Warfare.